Dee Cee Labs OMEGA-3 product prices are the best VALUE you can find anywhere. Our guarantee to you is that our OMEGA-3 is as good or better than any other OMEGA-3 on the market. No other OMEGA-3 is better than Foster Regals. 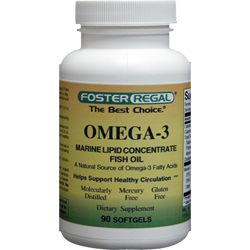 Suggested Use: As a convenient source of Omega-3 Fatty Acids (EPA and DHA), take 2 softgels three times a day. Contains: NO Artifical Color, Flavor or Sweetener, NO Preservatives, NO Sugar, NO Starch, NO Milk, NO Lactose, NO Wheat, NO Yeast, NO Shellfish and is SODIUM FREE. Warning: Do not take this product if you have or have had a recent surgery or bleeding disorder, are pregnant or lactating woman or are taking blood thinning drugs.